You are currently browsing the tag archive for the ‘2001’ tag. 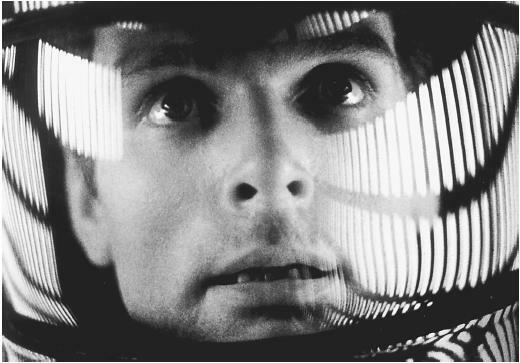 Kubrick explains in an interview the plot of 2001: A Space Odyssey – “You begin with an artifact left on earth four million years ago by extraterrestrial explorers who observed the behavior of the man-apes of the time and decided to influence their evolutionary progression. Then you have a second artifact buried deep on the lunar surface and programmed to signal word of man’s first baby steps into the universe – a kind of cosmic burglar alarm. And finally there’s a third artifact placed in orbit around Jupiter and waiting for the time when man has reached the outer rim of his own solar system. When the surviving astronaut, Bowman, ultimately reaches Jupiter, this artifact sweeps him into a force field or star gate that hurls him on a journey through inner and outer space and finally transports him to another part of the galaxy, where he’s placed in a human zoo approximating a hospital terrestrial environment drawn out of his own dreams and imagination. In a timeless state, his life passes from middle age to senescence to death. He is reborn, an enhanced being, a star child, an angel, a superman, if you like, and returns to earth prepared for the next leap forward of man’s evolutionary destiny.